Seventeen months after unpacking my golf clubs in Southern California, I finally realized one of the tee times of my dreams on Tuesday: the South Course at Torrey Pines in La Jolla. The South, site of the 2008 U.S. Open and the annual PGA event, is where you come to walk in the footsteps of the pros and test yourself against the best. As much as I had wanted to play this round soon after I moved out, I was cautioned to be leery of the challenge and really wait until my game was ready, or, I was told, it’d be like booking a luxury cruise and spending the entire time fighting sea sickness. So I waited and let destiny decide the day, which finally arrived when I was invited to play the media event for the PGA’s Farmer’s Insurance Open, which takes place Jan. 23-26. 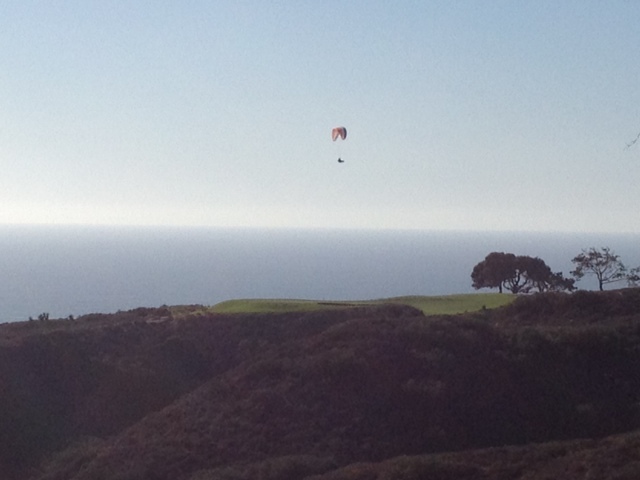 The day before my round, I recalled the speech I gave in golf school about the history of Torrey Pines. After my presentation, I asked for a show of hands from people who’d played the course. Six hands went up, which was reduced to two when I asked about the South. Having not even walked the course, but plenty aware of its reputation, I asked what made it so tough. The greens? “No, not any more severe than many country clubs you’ll play,” I was told. OK. The sand? “Plentiful, but not impossible and avoidable with smart play,” I was told. OK. The rough? “Can be a little tough,” they conceded. OK, what is it then, I asked. I looked up the scorecard for Torrey and immediately understood. I saw par-4 blue tee yardages of 467, 445, 462 and 422 and grasped what they meant. More or less, make friends with your hybrids and long irons before you go because you’ll be playing them often on your second shots. Per the set up of my event, I played the whites on Tuesday, which spared me about 400 yards and I figured would mitigate the challenges and make the course manageable. That proved correct on the par-3s and par-5s, but some of the par-4s still proved beastly hard. When I got out on the course, I discovered the rough to be about like after a good five-day rain in the Midwest. Uncommonly thick for California, the rough, combined with the narrow fairways, proved to be the real challenge of the round. Having played the beautiful, but more benign, North Course back in May, the South felt familiar, but it didn’t take long to realize I was in a very different place than just the other side of the course, although my game certainly held its own in the early going. Highlighted by a par on the iconic No. 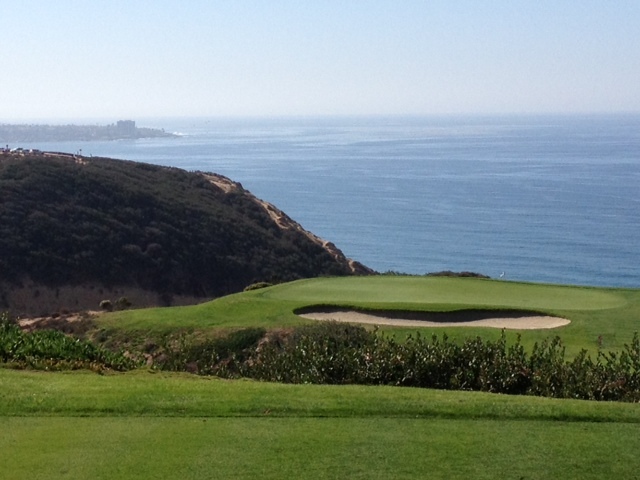 3, the par-3 with the postcard-perfect view of the ocean and La Jolla in the distance, I actually carded a respectable opening nine (even on the par-5s, one-over on the par-3s) and finished the front with the type of momentum that had me expecting the best was ahead on the back. I’m here to report that didn’t happen. Rather than bore you with a hole-by-hole breakdown of my closing bogey-fest, I’d like to walk you through a hole to give you an idea of what it’s like to be caught in the clutches of the South course. For that, I submit my experience at the 12th, a gorgeous uphill 443-yard par-4 played back toward the ocean into a gentle breeze. Save for the length and the standard bunker cluster and tree trouble on the right, the hole looks manageable from the tee and might be if you hit the narrow fairway, which I didn’t. Instead, I pushed my tee shot right, about 20 yards into the thickest rough on the course. After a lengthy search, during which I discovered two other balls before my own, I found my drive and was pleased to discover it was actually plenty long, just misplaced. I was 210 yards out, but a tree and the rough made a shot at the green impossible. It was a classic punch-out scenario, so I took my 4-iron and tried to muscle it out of ankle-high rough about 150 yards back in the fairway. I watched the ball shoot out low, hit the rough 5 feet before the fairway and … stop. Sigh. I was 81 yards out but at the mercy of the rough I’d had already hacked out of too often. And this is where the course starts to work on you. Fearing the thick rough muting my shot, I hit a full gap wedge. I caught it clean and carried the green, with my ball, ignoring my pleas, just barely disappearing off the back. Ugh. I found my ball just where I’d expected: five feet off the putting surface in thick rough, chipping back to a downhill. You probably can guess what came next. Trying to be too precise, I flubbed my chip four feet, leaving myself another nightmare chip. This time, naturally, the ball whizzed past the pin, leaving me a 25-footer. I two-putted for a seven. The same scenario had basically played out on the two long par-4s on the front. As I was told, that’s where the course gets you. Anyway, when you come to Torrey and are faced with deciding North vs. South, if you chose South, expect this to be you at some point. It’s part of the whole risk-reward thing, but, challenge aside, the rewards are many. A peaceful, awe-inspiring, historic setting. Birdies you truly will cherish if you are so lucky (I really would have loved to sink that 10-footer on No. 3). And a challenge that lets you know where your game really stands in the great golf universe. The only question now is if you’re ready to hear the answer. 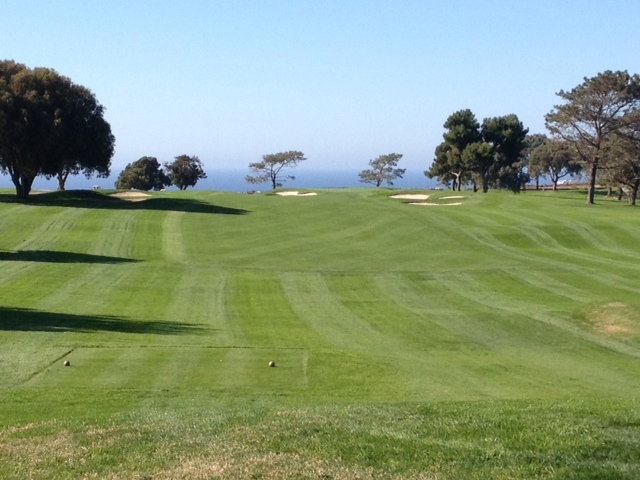 VIew from the 17th fairway (South), looking back toward ocean and the North Course. This entry was tagged La Jolla, South Course, Southern California, Torrey Pines, U.S. Open. Bookmark the permalink.